This Sunday morning breakfast experiment turned out so well that even though I don’t have an exact recipe, I felt compelled to share the ingredients and basic outline so that you can experiment and create your own recipe. When I was a kid, Sunday seemed like the worst day of the week – my sister and I trudging to Sunday school in uncomfortable dresses and too-tight shoes, having to help my mom with housework in the afternoon, nothing on television but Westerns, and the knowledge that once the long, boring day came to an end, I would have to wake up and go back to school. I wake up early to make sure the day lasts as long as possible, but it always starts nice and slow and usually the same way – on the couch under my favorite blanket watching CBS Sunday Morning and sipping coffee with a snoring Boston Terrier on one side and occasionally, if she’s feeling up to it, a ridiculously fluffy cat on the other. Then comes breakfast. I’ve always loved big weekend breakfasts, and whether I’m cooking for friends or eating alone, Sunday is my day to indulge. So as soon as the CBS Sunday Morning nature segment ends, the TV is turned off, I break out the cast iron skillets, and begin my search for breakfast ingredients. I had some chorizo left over from yesterday’s breakfast burritos – warmed tortillas filled with potatoes, chorizo, eggs, and cheese. I would have happily repeated the meal this morning but realized I was out of potatoes. Then the butternut squash caught my eye – a short, squat little squash from my Dad’s garden that has been waiting patiently for weeks on the bottom shelf of the pantry next to the more popular potatoes. Butternut squash and chorizo? Sure, why not? I proceeded to make a hash very similar to my Cumin-Scented Sweet Potato Hash, swapping in butternut squash for sweet potatoes, chopping the onions instead of slicing, and leaving out the cumin (chorizo is already heavily spiced, so I kept it simple). Since I wasn’t cooking for a crowd, I only used half of a medium butternut squash, half a large red onion, and about 4 ounces of fresh chorizo, squeezed from its casing. After the squash and onions were soft and slightly browned, I stirred in the chorizo and cooked, stirring occasionally, until the sausage was cooked through. Then I made a couple of holes in the hash to hold some fresh-cracked eggs. I stuck the whole thing in a 350-degree oven and let it bake just until the whites of the eggs were set. It was delicious. And after I topped it with some aged Gouda and popped it under the broiler to melt the cheese, it was even better. I made Sourdough French Toast, too. Since the butternut squash is pretty sweet, I might use half potatoes and half squash next time. I’d also like to try stirring in some fresh chopped herbs at the end. What would you do to make this recipe your own? Love breakfasts like these. Anything with eggs is great, and then you add chorizo!!! I'm rediscovering my cast iron skillet lately: surprisingly good for fish. WOW...thanks looks so good! I want! The butternut gives this a beautiful color. I have about 15 squash waiting to be used (the garden went a bit crazy last fall) and this looks like a great way to add variety to the usual roasted or soup options I have been relying on. Now that's my kind of breakfast! Mmmm this looks great! I did the breakfast thing today too and it was perfect. Love the idea of butternut in that hash. Yum! YUM! 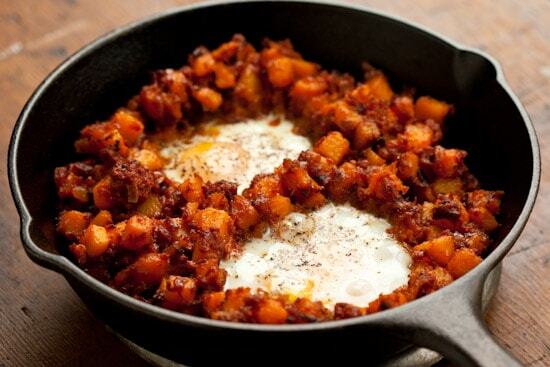 I love the idea of mixing in butternut squash when making a hash. Did it come out watery at all? Sometimes I find that sauteeing squash brings out a lot of water and things don't get as caramelized as I would like. Either way, you made this one look extremely delicious, combining some of my most favorite flavors. I'm not sure how much better this recipe can get! Maybe add some fresh pepper slices? I bet cilantro would taste amazing on top! Such a great way to start the day. Wow, it sounds like Sunday breakfast came together really well for you! Maybe I'll make this for my husband on his birthday! Oh wow, this looks so wonderful! In my opinion, you can't go wrong with chorizo and butternut squash :) I'm always looking for new breakfast recipes that are savory and low on the refined carbs. I might try this out next weekend! This looks like a piece of breakfast heaven. Wow love the idea of using the butternut squash. Looks like a yummy Sunday breakfast to me! Damn, that looks terrific! And so darn gluten free! Lordy that looks good. Nice work with the eggs also! Amazing, what a great breakfast...or lunch...or dinner. I don't know that I would change the recipe. Sounds delicious! Holy moly, that looks so dang good!! Love the shot of the eggs! this look very tempting and oh so delicious:) yum! This sounds perfect as is! In fact, I've got a butternut just waiting to be used up on the counter! It's a little eerie how alike our Sunday mornings are. CBS Sunday Morning (I adore Charles Osgood and Mo Rocca! ), animal curled up next to (or on) me, then the big breakfast. Even our breakfast burritos are nearly identical... I also use Mexican chorizo, eggs, potatoes and cheese (cheddar!). But I spread my tortillas with chive and onion cream cheese (Philadelphia makes some) before I sprinkle on my cheese and pile on my filling! I HIGHLY recommend the cream cheese! These breakfast burritos are mine and my husband's favorite breakfast! We're having burritos this weekend and I think I'll be making this hash next weekend with the chorizo I don't use this weekend. I'm excited! Ohhh YUM. Wow this looks so fantastic- as soon as I am back from my travels and in my own kitchen I am going to be making this! Wow! Now I'm really hungry and it's 11pm - midnight snack? Probably not tonight, but Saturday is coming. Heat and sweat are a great combination. I love to add honey to my chili to balance and offset some of the heat. I'll be using your notes as inspiration this weekend! I’m happy I’m not the only one drooling around here. It’s a great dish for a weekend breakfast. Thanks for the idea. Oh. My. This sounds SO good. Definitely need to get some chorizo for my breakfast next weekend. This recipe looks great! We usually make butternut squash soup that is spicy so we will have to give this one a try. Nice recipes- keep em coming! Seems like the perfect breakfast. I love the idea of the chorizo with the butternut. I love your site. I was looking through it for some inspiration for dinner tonight. Can across this. You can eat breakfast for dinner right? i love this! perfect breakfast / brunch for this time of the year!! going to save this one on my favourites! Do you think i can do this on a camp stove? with out an oven? Jessica - Yes, you can just cover it with a lid rather than using an oven. Enjoy!